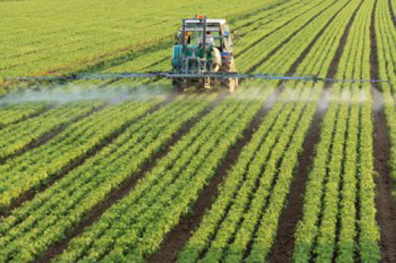 Above: Spraying the whole GMO RoundupReady crop with Monsanto's Roundup (glyphosate) was originally supposed to kill all the weeds while soybeans, corn or other glyphosate-resistant crops would survive. There has been a more than 1900% increase in glyphosate use on RoundupReady soybeans from 1994 to 2006, according to the Center for Food Safety in May 2008. Below: But RoundupReady crops have ironically provoked “frankenstein weeds” that are no longer killed by Roundup glyphosate, but thrive causing even more problems. 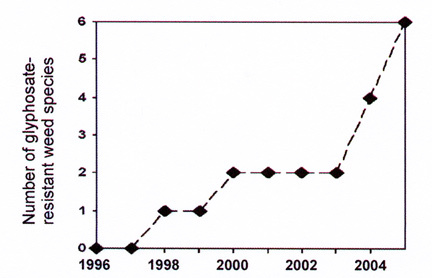 This graph shows the rising number of known glyphosate-resistant weed species in United States since 1996. Source: Facts About Glyphosate-Resistant Weeds by Chris Boerboom, Univ. of Wisconsin, and Michael Owen, Iowa State University, 2006. January 27, 2012 Fairfield, Iowa - In December 2011, the United States Department of Agriculture announced approval of another genetically engineered corn manufactured by Monsanto that allegedly is “drought tolerant.” Behind the scenes, USDA received over 40,000 public comments opposing the new Monsanto GMO corn.